Customizing a pair of jeans means you can give your clothes your own, individual, unique look! 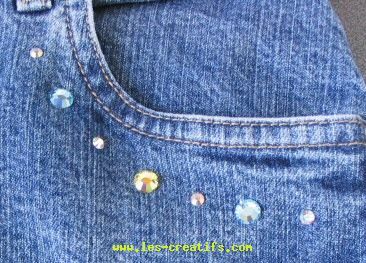 Here are some examples of rhinestone designs that you can easily apply to a pair of jeans, now it's your turn! All the rhinestones are hotfix (can be glued on by the application of heat), and are applied using an iron or (even easier) an electric applicator tool. The following instructions are for people using the ironing method. The jeans are placed on the ironing table, the rhinestones are placed in the desired position. Then a piece of cotton cloth is placed gently on top of the rhinestones before being ironed (for about twenty seconds at a temperature of 170°C/338°F). The larger, thicker rhinestones (the SS34) are applied last using the iron upon the reverse side of the fabric: this is why these rhinestones are placed close to the pocket or on the cuffs at the bottom of the jean legs. The end result, which isn't overly flashy, but which is definitely unique! Good to know! 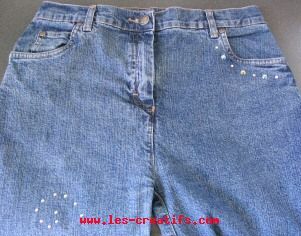 these jeans have been worn, washed and tumble dried a dozen times: the rhinestones are as good as new! Since a very hot iron is used here an adult must be present to supervise this activity.